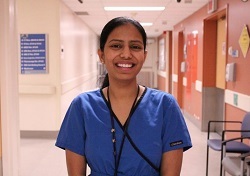 At the beginning of the year, Chitra Muthupalaniappan, MRI Technologist at Toronto Western Hospital, prevented what could have been a tricky situation for both patient and staff. It was a chilly Tuesday in January, and the MRI department was bustling. A patient came in for a scheduled pre-op MRI when Chitra became aware of something significant – the patient had a previous moderate allergic reaction to contrast at another health care facility. This was not noted in the MRI order, and the patient was not pre-medicated. Being careful to pause and think through the situation, Chitra consulted with a radiology resident before she proceeded to scan the patient without contrast, noting the allergy in the radiology report platform along the way. Chitra’s actions prevented this patient from having another reaction, but they also highlight the need for constant communication with the patient at every step, for improved care and pre-medication in the future. Chitra graduated from the Nuclear Medicine program at Michener in 2008 and completed most of her MRI training at Michener through NAIT in Alberta.